I have a daughter, who shall remain unnamed for the duration of this post, who has a weird tic in which she stores her already-worn socks in random places around the house. I've seen them on bookshelves, on the printer, behind the TV, on the stairs, under the couch, on my sewing desk, and we don't even want to know how many are under her bed. I haven't seen any in the fridge, though. Not yet. I was putting something away in her coat cubbie just now (think preschool cubbies – we have a set in our kitchen and each girl has a "locker") – seven socks at the bottom of it. SEVEN. And we have a little laundry pile stash at the top of the basement stairs (it's not a good system, but still, it is a system) – this laundry pile is a mere five steps away from said coat cubbie. But no. The coat cubbie is evidently now the go-to place for storing stinky socks. It may not be much, but it’s ours. What’s ours? Our summer. For maybe the first time since about forever, life has actually slowed down since the beginning of May. Our May got easier to handle because we axed softball from the schedule. Best. Move. Ever. Our June has been low-key because I just said NO to all the programs designed by well-meaning organizations and churches to give parents a “break.” No day camps, no VBS, no nothing. The girls will get their camp experience next month when we combine our family vacation into a combo vacation/camp two-for-one punch. But what that means for us right now is that we’ve had the month of June to just be. And that’s exactly what we’ve been doing. It’s summertime…and the living is easy. For now. We’ll take it. New post up at WORLD Mag. Men are taking it from all sides these days. The Super Bowl commercials this year were particularly noteworthy for their shots at the lack of masculinity of men. I recently read two articles written by women in two different publications in which their premise was that men (to be specific, fathers) are dispensable and non-essential. While I found the Super Bowl commercials to be humorous, there was some truth the advertising companies were hitting on: Over the course of time, our culture has been stripping away the manliness from men, and given enough time, we might reject the need for men altogether. One of the articles I read ended with this straw man argument: “The bad news for Dad is that despite common perception, there’s nothing objectively essential about his contribution. The good news is, we’ve gotten used to him.” So familiarity is the only reason we keep men around? I started to take the bait, listing out all the reasons my dad (as well as my own husband) provide “objectively essential” contributions . . . that is, until my husband mentioned that the author’s argument is absurdly modern: Humanity (male or female) cannot “objectively” be qualified or quantified; we’re not math problems. Men, I can’t speak for anyone but myself, but I will say this: As a woman, I’m sorry that the feminist pockets of our culture would just as soon shoot you as keep you around. Your role is not non-essential. You provide so much more than a paycheck; you provide stability and support and love and direction and a whole host of other things. Yes, a woman can also provide those things, but you are uniquely created by God to do so in a way a woman never can. The bottom line is that, though there are examples in which the exceptions to the design works, those exceptions don’t negate the original plan and design God put in place for families: One man and one woman, united together, working toward the common goal. Ms. Paul, author of the aforementioned anti-dad worldview, does not speak for everyone. Men, look at your wife and your children and believe the truth. You are necessary. Your role in the home and in society is essential. Your influence on your kids as well as their fatherless friends can’t be quantified. You are needed. I’m not exactly what you would call a concert connoisseur. A few years ago I listed all the concerts I had attended thus far and while I need to update that list a little now, it wouldn’t take long. I like a good concert, like the rest of us, but the price tag combined with our 6-member family usually makes their attendance a luxury we can only enjoy vicariously through others. 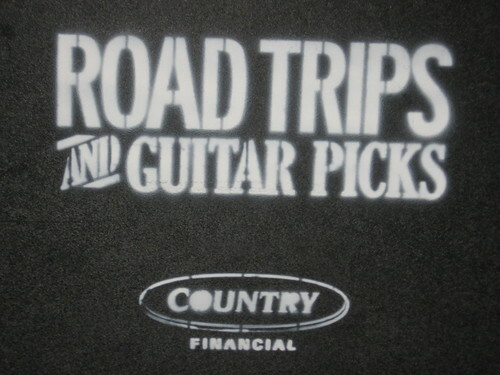 So when the Trips and Picks rep from Country Financial contacted me about attending the Jewel concert last weekend, I actually postponed a planned trip to Kansas City by one day so we could attend. Yes I did. And I can sum up the entire concert in one word: amazing. The Sheldon by itself is amazing. I’ve been there before. They run some really well done educational concerts I’ve taken the girls to and we once attended a wedding reception that was held in their ballroom on the fourth floor. 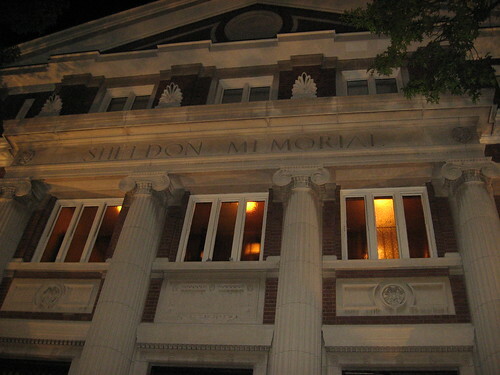 I love, love, love going to the Sheldon. Seriously. The backstage experience (which was really in the fourth floor ballroom) made me realize two things: 1) This is a different crowd than the one at the Jason Aldean concert and 2) You don’t know a performer just because you’ve listened to a few of her songs. It is easy to think you have a handle on who somebody is because you’ve participated in what they’ve produced. In the few moments in which we heard Jewel give a piece of her story, it was easy to see she’s thoughtful and witty and funny and talented and…likeable, darn it. The show itself was just unlike any other concert I’ve ever attended. Jewel came out expecting to interact with the crowd and her mission was accomplished. She mixed old songs in with the new and the new ones she did were as interesting to listen to as the familiar ones. She told stories and really wove her life in with the music. Anyway, I could go on and on and on, but I won’t. Instead I will say this: If you get the chance to see Jewel live, GO. I’m serious, GO. New post up at WORLDMag today. The other day I went to our community center to purchase our pool pass. This is usually the best investment we make every summer, as our kids never tire of going and are finally old enough that, if I’m lucky enough to snag a beach chair, I can read while they swim. It’s a win-win. Dumbfounded, I looked at her and said, “Are you seriously telling me that I have to pay extra because we have six people in our family?” She stuttered a little as she pointed to the handbook and showed me the rules in black and white: The family pass was for five people; any “extra” members would be an additional $15. I get pretty worked up when a business or government decides what an appropriate number should be for a family. This community center is not alone in their decision to penalize families for having more than their prescribed set number. She nodded her head and handed me the business card for the aquatics manager. I paid the extra $15 and picked up our pool pass. And now I’m off to write a letter—probably from a beach chair near the high dive. 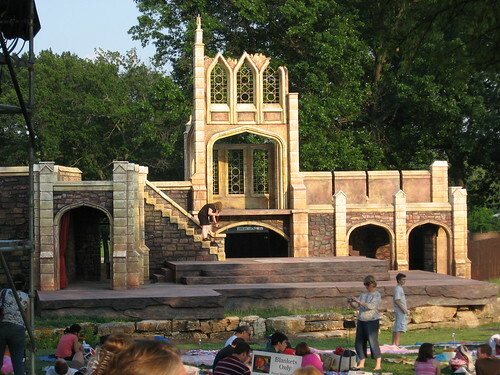 Every year there is a free production of Shakespeare in the Park that kicks off the summer in Forest Park. Every year we talk about going but never go. This year we made it happen. And we kicked ourselves for waiting this long. Lesson learned. 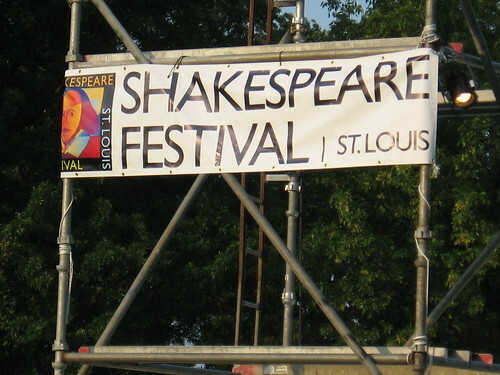 Shakespeare in the Park in St. Louis totally rocks. 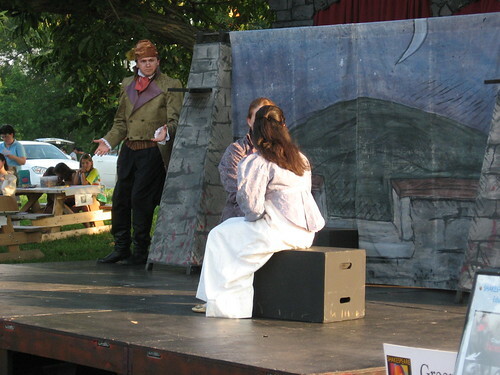 This year marks the tenth anniversary of these outdoor productions and they did Hamlet. Now I’ll confess, I’m a little rusty on my Shakespeare. Okay, if you consider that I wasn’t really even sure what Hamlet was about, I guess I’m a lot rusty. But, as we discovered last night, it’s okay if you are rusty on your Hamlet. Before the show begins they have “The Green Show” in which they do a 20-minute version of the play. 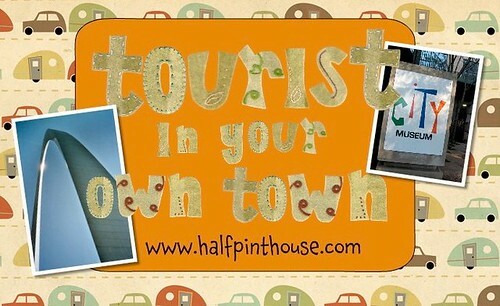 It is VERY good for giving you an overview of the story. The girls enjoyed it so much they watched it twice. 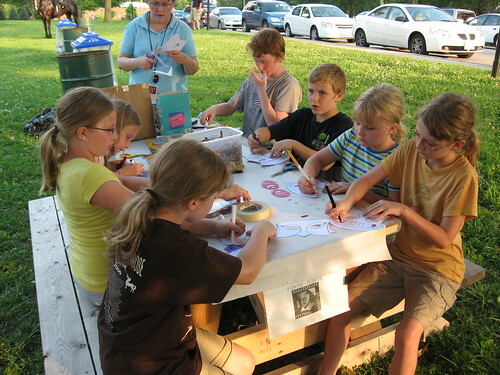 Right next to the Green Show stage, there are tables with crafts for the kids to do. 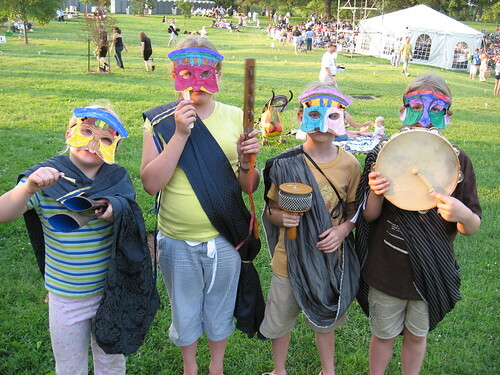 The kids made masks and crowns and then dressed up with brocade fabrics draped around them and paraded through the crowd with musical instruments. There was more pre-show entertainment by way of jugglers and jesters who interacted with the crowd. And then there was the play itself. I was not allowed to take photos during the show, but I did snap a photo of the set before the show started. 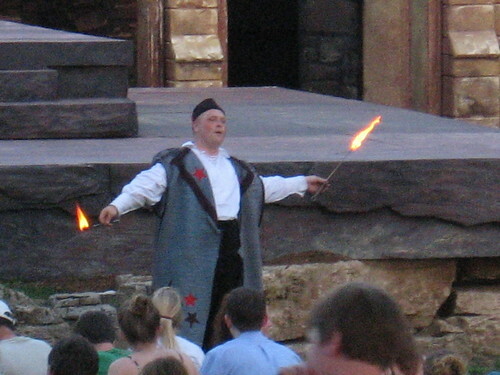 Arrive by 6pm – The play itself doesn’t begin until 8, but there are things to do beforehand (like The Green Show, crafts, and crowd entertainment). You need to get there early if you have any hope of securing a decent seat. Bring blankets and pillows – lawn chairs are optional – We hauled in three blankets and at least 6 pillows in addition to two camping chairs. If we didn’t have the chairs we could have moved up to that “blankets only” section. I’m thinking next year we’ll bring crazy creek chairs or something so we can sit up there. Of the six of us, I’m the only one who used the camping chair the whole show. Everyone else got comfy with the blankets and pillows. We used one blanket to save the spot in front of the girls from anyone tall sitting there and it worked (shhh, don’t tell on us). Bring food – I thought packing out dinner would be too big of a hassle this year so we ate at home before we left and just brought some snacks. But really, you have so much time before the show starts, it would have helped the time to pass had we just eaten dinner at the park. Lesson learned. Bring jackets – I would never have thought of this, but we were encouraged to bring jackets because by 11pm, it does get a little cool.